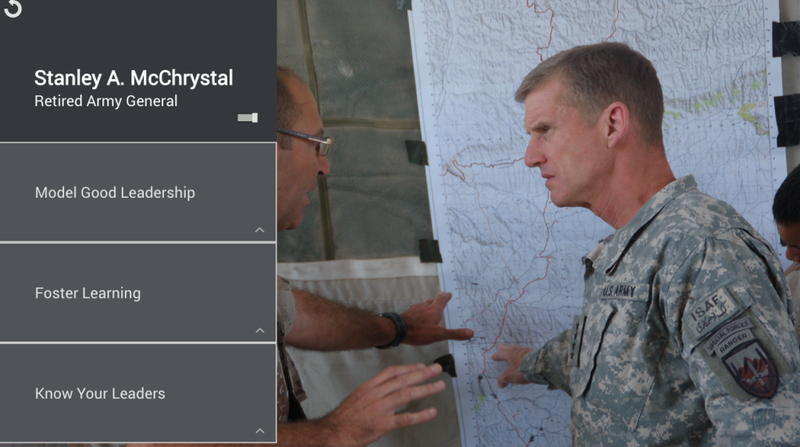 A particularly challenging project, we created a tool for developing leaders within the U.S. Army. I took on the role of lead product designer and worked closely with a UI/visual designer as well as project managers, stakeholders and a development team that we contracted to carry this project to completion. The Army has a large number of field manuals, handbooks and other documents that hold valuable information for its leaders, but they are severely under-utilized. Most soldiers lack the time to read this dense material and this has lead to a deficit of strong leadership. The Army needed a fresh and engaging way to educate some of its most important personnel. 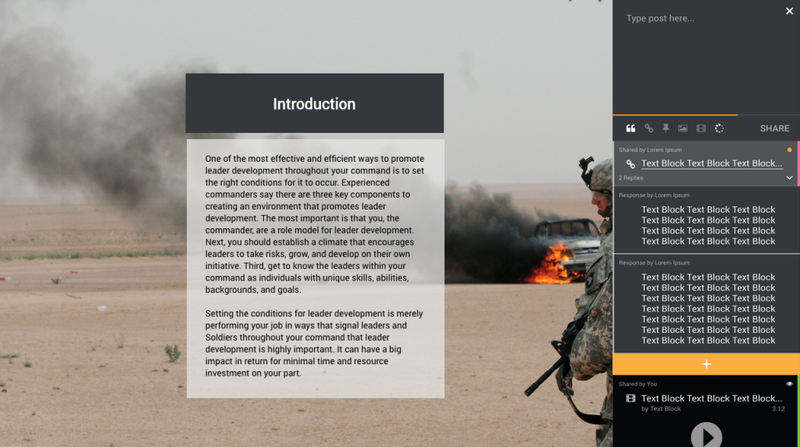 The Leader Development Application was initiated when Rowan technology saw the need for a digital supplement to the U.S. Army’s field manual on leader development. We believed that we were well positioned to create this supplement and compete for a contract to fund further development. Due to the delicate leal nature of military contracts, we were faced with the challenge of creating a product with minimal guidance from the intended client. To fill this crucial gap, we hired a former Colonel and PHD in behavioral science and leadership as a consultant. Together, we were able to identify the Army Leader Development handbook as a key piece of Army doctrine that we could transform into an engaging product. This gave us a clear goal: to bring the text within this document to life through a digital product. 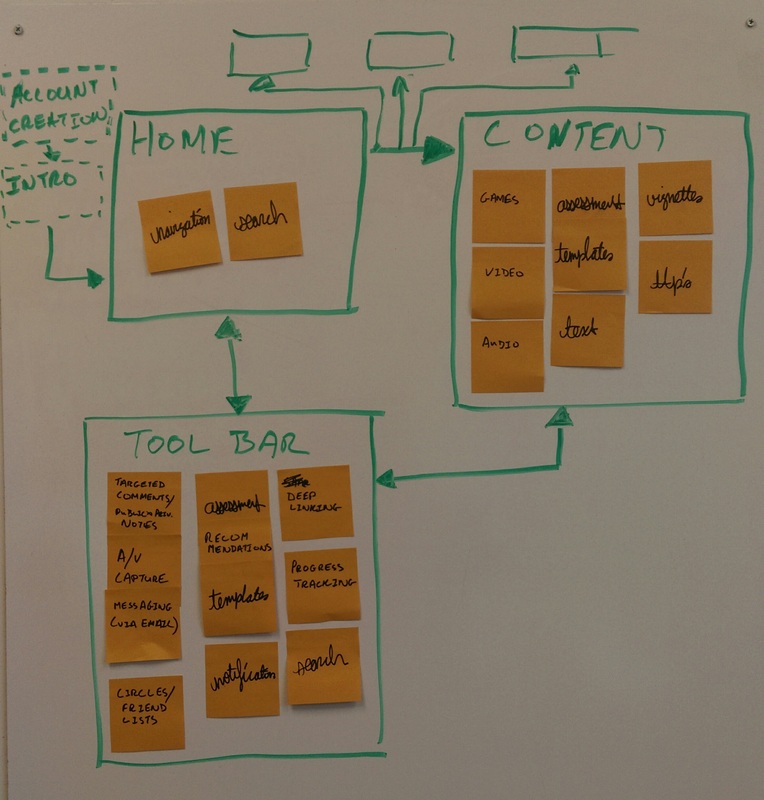 We began the design process by taking a deep dive into the content, reading the handbook front to back, and searching for concepts that would show us the best way to transform this content. I Identified one of the guiding principles of leader development: that development occurs 10% through references and text, 20% through mentorship and 70% through application. I realized that these three actions could be carried out within our product using a variety of tools. We already had the text, mentorship could be done through video interviews with well respected military officials whom we had connections to, and application could be approximated with quizzes and interactive modules. Early on, my team and I wanted to get an idea of how we would ideally balance the various types of content we would be including in the product. This was based on assertions made about self-education in army doctrine. We validated our approach with our consultant and stakeholders before continuing. 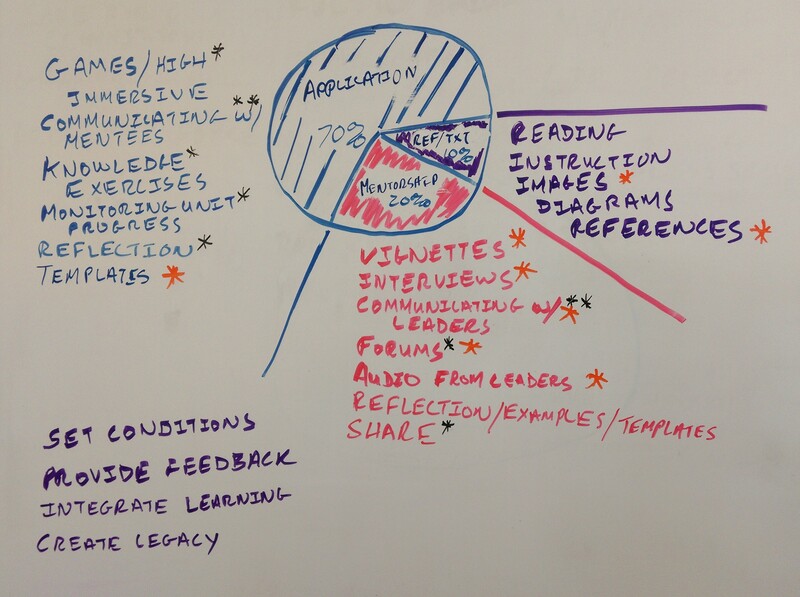 We designed the page structure utilizing a user flow, and decided that a non-linear structure would make the most sense because of the personal nature of leader development. The strengths and weaknesses, as well as the learning styles of our users could vary greatly, and we wanted to do everything that we could to support them despite those differences. Planning out how to organize features within the product. From that point, the designer I was working with developed a style guide as I wireframed the pages that would be built. I did this first using a white board and then using Adobe Illustrator, getting feedback from our consultant and stakeholders wherever possible. Simultaneously, our company was finalizing a statement of work agreement with a development company that would implement our designs, and wanted to be sure that this was a wise and necessary investment to make. 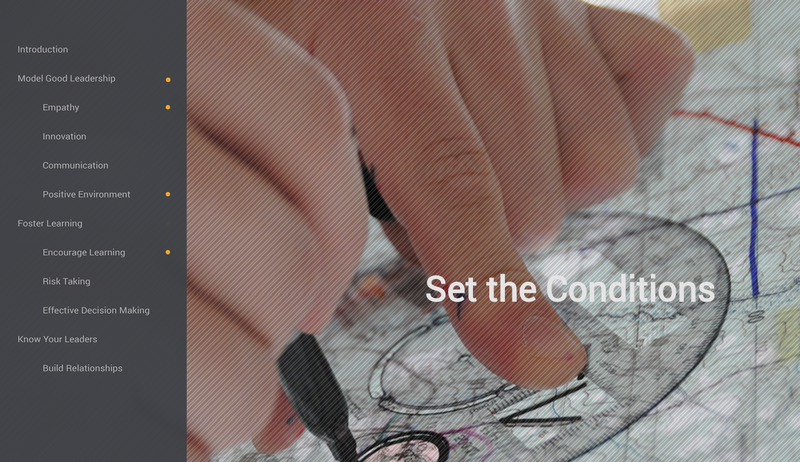 Soon, internal stakeholders began to push for a more robust, interactive prototype. In the past, that had been done by drawing upon our limited development capacity, which was very costly in terms of hours and resources. In order to avoid getting stuck in such bad habits, I recommended that Rowan’s design team take the time research and agree upon a prototyping platform that would allow us to create the necessary MVP at a much lower cost. We quickly decided on UXPin because it offered the highest fidelity in terms of design and interactivity with the smallest learning curve for our design team. The leader development application would be used to confirm that this would be the right platform. Once this prototype was complete, we were able to validate our designs with potential clients and experts before beginning development. Once development began, the other designer on the project was resourced by another department and it became my responsibility to communicate with our developers and insure that they understood and properly implemented our designs. A beta version of the project has been completed and awaits further funding for continued development. A prototype of the interactive video tool. Thinking about how we can use social media within our product. This was a rewarding, if often difficult project to work on. The challenge of not being able to communicate directly with a client was often disorienting, as stakeholders often had trouble agreeing on core aspects of the product. This tension could have been eased, though, by utilizing user testing more often to get outside confirmation of our ideas and designs.